From the age of 6 years old, I suffered with spinal problems which made life very difficult. Because of this I was unable to exercise so my weight escalated which wasn’t helped by the fact that I loved to eat sweets and crisps. I then had spinal surgery but this caused me to put on more weight! It was so important for me to lose the weight to assist recovery but I tried so many different diets and none of them really worked. My mum and sister took the tablets from The Slimming Clinic so I knew that this was a successful way to lose weight. Consequently when I reached 18 I was hopeful that they could help me too. Now that I have lost over 4 stone, I look and feel better – and everyone comments on how fantastic I look. I can also buy clothes from anywhere now whereas before I was limited to places that had larger sizes. More importantly, my back is now less painful, and due to the weight loss, I am able to keep active which is so important for my spine. 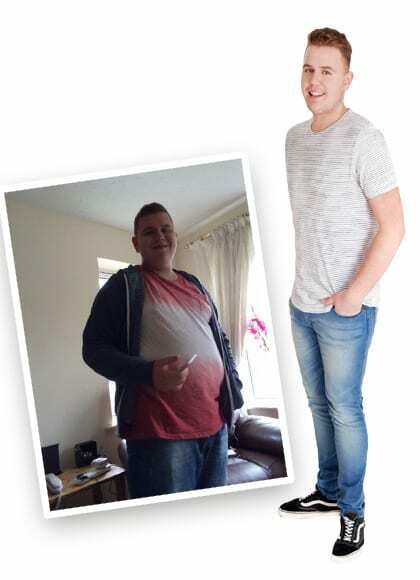 The Slimming Clinic have been so helpful and supportive throughout the whole process of my weight loss and the programme is easier than any other diet. Once you stick your mind to it and focus, the goal can easily be achieved. I find that buying a pair of jeans in a smaller size gives me that extra push to attain my goal. I have only one more stone to go; I have come such a long way! If I put a pound or two on one week, the next week I am even more determined to reach my target. I still eat some unhealthy foods, but just in moderation – if I eat more one day then I eat less the next to compensate. Before losing weight, it was too painful to be active but now thanks to The Slimming Clinic I have more energy, my back problems have reduced, and I am so much happier. Thank you The Slimming Clinic.